This On Belay first appeared in Alpinist 38—Spring 2012. "WATCH ME," JAMIE VINTON-BOOT calls out. He dinks at the aquamarine-hard ice with his tools. His frontpoints scratch above the obsidian depths of a sepulchral crevasse. "All good, mate. You're looking solid," I shout back. The rope slivers over the narrow ramp of glacier beneath my feet. Jamie hasn't placed an ice screw yet. If he slips now, he'll pendulum right into the crevasse. There's water dripping somewhere. I feel a sudden, voyeuristic urge to peer into the darkness of the deep cleft below. My friend talks to himself, his muttered words lost across the chasm. Should I offer more encouragement? When I was younger, I realized one day that the more animated my belayer became as he extolled my leading virtues, the more dire the situation actually seemed to him. I try again: "Just take your time, Jamie. No rush." But this statement isn't right either. Early morning sunlight has already arched over the remote Stevenson Glacier. Forty kilometers to the west, a dark, thickening cloud oozes in from the edge of the Tasman Sea. The next front isn't far off. The day is getting away from us, and we haven't even reached the start of our proposed route. I doubt Jamie is paying attention to anything other than the ice and his frontpoints. He's hard of hearing and probably can't catch what I'm saying. I'm calling out reassurances to make myself feel better. But Jamie has the ability to bend the reality of climbing sequences, making them appear easier than they are. He'll deal with this. I'm not looking forward to following. Jamie resets his axes, and the tinkering sound of falling ice echoes across the morning air. Another good friend, Kester Brown, shares my belay stance. He's quietly munching on a muesli bar. "That's a bomb site over there," he says. "Jamie will be coming back." "You reckon?" I reply. "Christ, how are we going to get through this bloody maze?" It's still early in the summer alpine season, yet already cavernous gaps have opened in the glaciers. Kester says nothing. Not inclined to get worked up about anything other than burnt coffee, he turns to look across this rugged pocket of our Southern Alps with a wistful gaze. To the north, the Stevenson and other feeder glaciers plunge over weathered rock slabs on the western flanks of Mt. Elie de Beaumont and Mt. Walter. To the south, the icefields warp back from the more shattered, blocky rifts of Mt. Green. We are hoping to tackle the unclimbed West Rib of Mt. Walter, a chipped fin of coarse greywacke sandstone half a kilometer high. But even reaching it is proving difficult. I kick at the ice with my crampon. Two hundred meters below us, the Stevenson fingers into the broad palm of the Spencer Glacier, sagging between the barren knuckles of the Drummond and Burton ridges, before it disintegrates into the Callery River hundreds more meters down the valley. Even from this distance, the unbraided river appears turbulent. Aoraki/Mt.Cook, New Zealand's highest mountain, is a few kilometers farther southwest, hidden behind the serrated summits of the Main Divide. 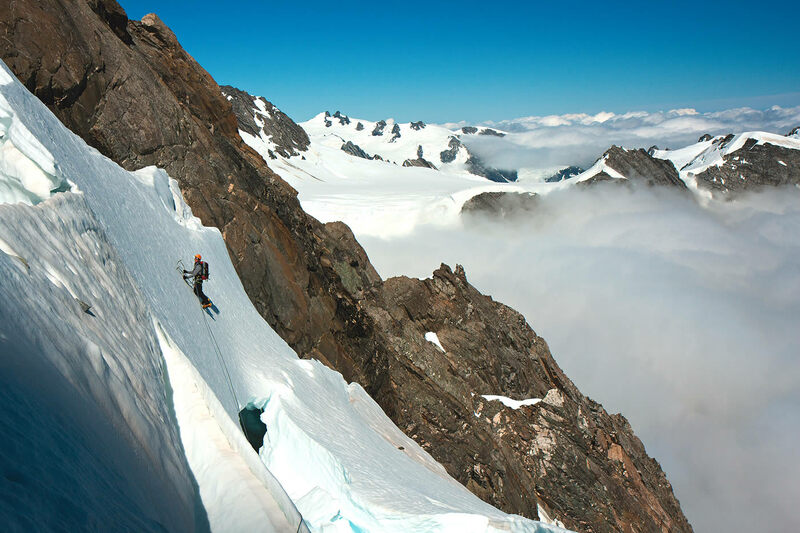 There hasn't been a first ascent recorded in this part of Westland Tai Poutini National Park since 1984. As far as we know, no one has even attempted a route from the Stevenson in the past decade. Looking at the terrain we still have to negotiate, it's easy to understand why not. At last, Jamie reaches the other side of the crevasse and clambers over a low fold of ice. He disappears from view. My wife, Shelley, is perched on a divot in the glacier a few meters behind Kester and me. She inches higher to try to glimpse what Jamie sees. Moments later, curses float over the void, and Jamie returns. He shakes his head. Kester shrugs his shoulders. He's probably already thinking about heading back to our tents to brew fresh coffee. My wife smiles at me and then starts cramponing back across the slope we traversed at first light. She skirts a short ice cliff and vanishes down a snowy ramp. I know she's searching for another way through the jumble of crevasses. Shelley hates giving up. PERUSING OLD GUIDEBOOKS and alpine journals before the trip, I'd noticed that first ascents in the area tapered off in the early 1980s. 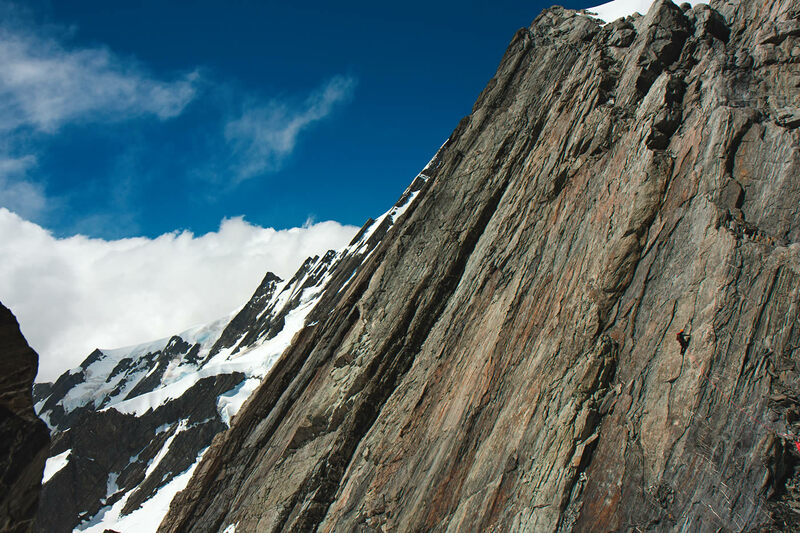 Yet the few people who climbed there wrote about good quality rock, at least by New Zealand alpine standards. Brittle zones of greywacke or argillite (a type of crumbly dark horror) appear throughout our higher mountains. Most climbers stick to ice and snow. Or else they wait until winter when the fractured rock is frozen together. Occasionally, a solid, compact weathering rind forms on certain rock strata. Signs of pinkish, orange and red bands usually mean there's good climbing to be had. I'd first spied the auburn hues of the West Rib of Walter in 2000, while guiding on the Franz Josef Glacier. 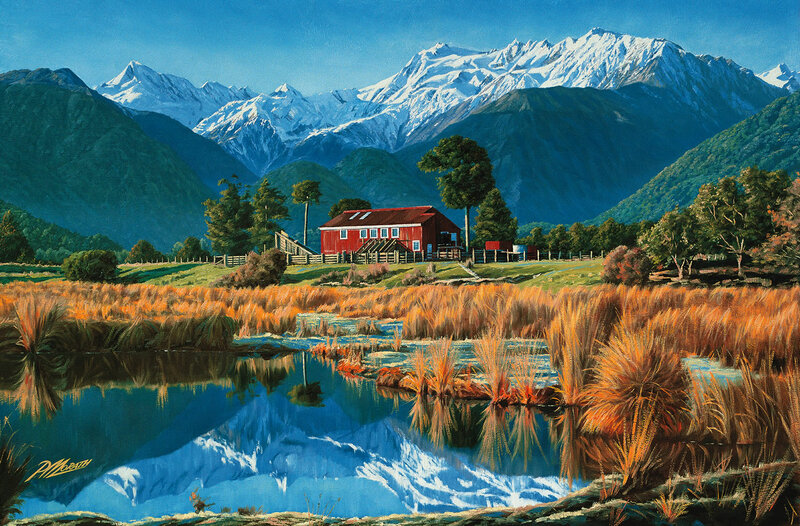 Every clear morning for the next two years, I carried coffee outside my cottage in the coastal settlement of Okarito. I leaned against the railing, swatted sandflies and faced the sunrise. The silhouettes of Elie de Beaumount, Walter and Green craned over thick, dark rainforests and the white splodge of the Spencer. Day after day, I stared at that same view. Sometimes a warbled morning sun made the mountains shimmer in the sky. Other times, in flat sepia-toned light, the summits seemed so close that I could almost reach out to them. I promised myself that I would, someday, climb them. Yet after a number of forays from the Franz, I realized the difficulties involved. In the summer, glacial thaw cut off the western access. With no icy bridges to clamber down, all that remained were steep, impassable walls of rocky detritus. The most logical approach seemed to be from the east, traversing the country's longest glacier—the Tasman—and then climbing over the Main Divide. A straightforward hike of around twenty-five kilometers. It took more than a decade for me to carry out that plan. Each season, the icefields of the Southern Alps seemed more broken, and moving through them grew tougher. What used to be easy snow shelves morphed into unreachable hanging glaciers. Whether it's because of glacial recession, climate change or a temperature anomaly, I've watched entire icefields slowly vanish. Despite the relatively small size and low altitude of New Zealand (Aoraki/Mt.Cook is only 3754 meters high), more than 3,000 glaciers spread over its mountains. Yet according to studies by the National Institute of Water and Atmospheric Research, over the past 100 years, the surface area of those glaciers has reduced by 49 percent. And by the end of this century, NIWA claims that warming in the Southern Alps could mean an average summer temperature increase of up to three degrees Celsius. Freezing levels could rise by 500 meters. 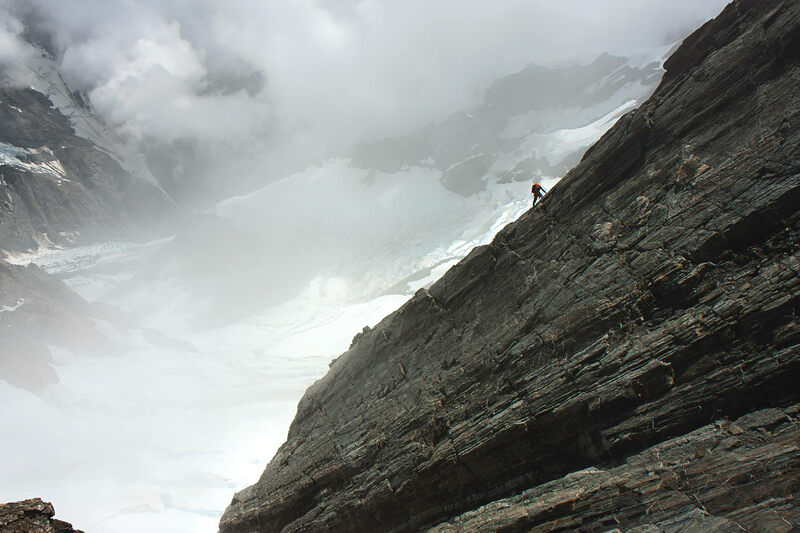 As the ice melts, and the glaciers break and collapse away, the dirty, unstable bedrock becomes a nightmare to climb. It's as if our alpine world—or the way we appreciate it—is being torn apart. How long will it be before we're doomed only to imagine the lines still waiting around the next ridgeline, or beyond the next glacier, to wonder whether we will ever be able to get there to find out? SHELLEY REAPPEARS on the snow slope below us, breathing heavily from the exertion, but grinning. "There might be a way over here," she calls out, pointing with her axe. "We can't get farther down the glacier, but I think we can get off the ice onto the ridge." The rest of us shuffle over to where Shelley indicates. There's a wide gap between glacier and rock, but a narrow, fragile-looking tongue of ice juts out over a constantly rumbling ice cliff. Access across the tongue looks tenuous; it might just go. Ice collapses nearby with a loud whompf, making us all twitch. The glacier gives a gentle shudder and settles again. I quickly establish an anchor—and myself—in a nearby crevasse. That way, I won't have to test the ice tongue first. When no one else makes any moves toward the edge, Kester sighs. Since he's the tallest, it seems appropriate that he should go first. Kester gives his ice axe a good thunk into the undercut slip in the glacier. He peers over. "Don't like this much," he mumbles. He shuffles his crampons for a few seconds before finally re-hooking his axe on a last, thin, icy protuberance. Extending his long legs, Kester reaches for the rock. 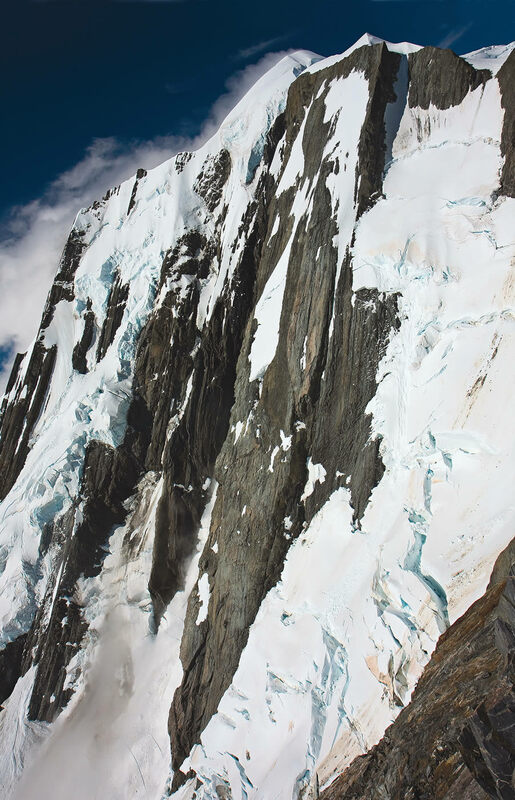 He snares a narrow ledge with his crampon, lets out a small "woo-hoo," and scrambles up the blocky ground to set a belay. Shelley, the shortest in our group, has to swing one leg repeatedly, building up momentum before she can stab across the gap. Her crampons scrape against the rock as she searches for purchase. Once stable, she leans out, drapes her axe over a rock flake on the other side and then lunges the rest of her body over. Jamie climbs down to the edge, says "Bugger that" and clips his ice axe to his harness. "Give me some slack," he calls up to me, before jumping like a movie character. Somehow, he manages to stick to the small ledge on the other side. "Sometimes I just do stuff without thinking about it too much," he says, in a nonchalant tone, as if he's making a valid excuse. "Go for it," the others shout when it's my turn, but the prospect of repeating Jamie's aerial feat makes my aging knees quiver. I sink the pick of my axe as deep as it will go into the ice, clasp it with two hands, and push one leg out behind me until it clatters against the rock. Once stemmed between glacier and rock, I breathe a sigh of relief. At the belay, I pause to take in this broken rib of red greywacke that we're about to climb. The rock curves toward the skyline in a graceful arch, a totem that will entice us upward for hundreds of meters. I can't help laughing: we've made it across, into the kind of place that climbers, perhaps, treasure most. THE ROCKFALL SOUNDS LIKE GUNSHOT. Each projectile whirs by and cracks against the cliff. I cling to the wall, hunching into as small a target as possible and listening as the barrage gets closer. Stones ping off my helmet. I shut my eyes and try not to think about much. Something larger thuds close by. I utter a few words of hope to a deity I don't believe in. More cracks resound against the rock. Some ricochet, and others explode on impact, spitting debris over me. Is this it? Is this the final moment? Eventually, the noise recedes to faint echoes in the gully below. I take a deep breath and slowly unfurl. The others are out of sight above me, and, seemingly, out of earshot too. They probably don't realize what just happened. They'll be thinking that I've paused to take out a piece of gear. Perhaps the rope dislodged the rocks. Maybe climate change played a part in loosening the stones, or it was just one of those random occurrences. It doesn't matter why. The moment has passed. I begin climbing again. "How was that, Paul?" Jamie asks a few minutes later as I approach the belay. I can tell he's enjoying himself, and I can't help smiling back. "Pretty good," I reply. "Some solid moves to get over that bulge, eh?" I don't see the point in letting him know about the rockfall. I'd rather congratulate him on the lead. Kester and Shelley are already heading off on the next pitch, a steep slab with desk-sized, missing chunks. I suggest to Jamie that we follow a short buttress to the left to stay out from underneath them. Jamie hands me the rack. The weight feels reassuring in my grasp. The call of a kea—sounding like an elongated cry of the vowels in its own name—echoes from somewhere above. I look up. Red and green wings flash across the air. A foot tall, with a powerful beak and claws, these native mountain parrots are known for getting into mischief. Their antics include hopping into tent vestibules, hacking up smelly, seed-riddled bile like a dinner offering and hopping out again; worrying a pack strap until the pack falls apart; and tearing a tent to shreds in a sharklike frenzy. I hope that if the kea spots our tents, it chooses Jamie's over mine. The coarseness of the rock rasps my fingers—a comforting feeling, like a memory trace of past experiences. For me, climbing is always about the rock's particular shape, color and texture, and how to move with it. The patina of the sandstone in front of me is almost sunset-red. Fingertip cracks split its near-vertical surface and a thin ramp angles like a tree branch across the buttress, up and left. I slink along the ramp, ferreting at dead-end cracks. Finally finding a notch deep enough, I slip a cam into it and, slightly higher, a nut. I clip the rope through them and relax my grip on the holds. Now, I have the confidence to tiptoe up for another few meters. But then the edges and the cracks begin to vanish. The air is still. Another kea calls in the distance. This is when everything fades and sharpens. This is the time that matters. Breathe. Keep breathing. I slip one hand after another into my chalkbag, more a meditative preparation than anything else, and continue the traverse. A vague corner up and farther left looks like my next respite. Smooth, precise moves slip by. I feel as if I'm immersed within the intricate texture of the rock. Time seems to reverberate in the distance, or in some other place entirely. A muffled shout rises from Jamie. I scan for somewhere to belay. This awkward corner I'm bridging will have to do. Two small nuts drop key-like into a thin crack, and I shout back down in the direction of the rope. Shifting weight from one leg to the other, I look up, trying to judge how much farther we've got to go. A mossy rooflet hides the terrain above. The climb gives nothing away. Hours later, the summit ridge comes almost as a shock. I stagger for a moment, trying to readjust to the sudden change in geography from the steep wall to a nearly flat rock shelf. Broad ledges create a bench along the east side of the Main Divide in both directions. A few meters behind me, the glacier that winds back to our tents seems to float in the evening light. The sun's warmth fills me with renewed energy. As Jamie seconds the last few meters, a crimson glow draws across the mountaintops and tinges the glaciers pink. Jamie's not into hugs, but I grab him anyway. Kester shies away, muttering something about being all smelly and sweaty. Red glimmers catch in the tiny wisps of hair sticking out from under Shelley's helmet. We don't need to say anything to each other. She has the ebullience in her eyes that I recognize and love. The others start cramponing down the gentle snow slope, but I take a few minutes to look back over the Spencer. Through the low clouds that choke most of the valley, I try to eke out other crannies worth investigating. A long rippling slab runs up the western flank of Elie de Beaumont: Could we reach it? I can't see whether the narrow glacier beside it goes all the way to the neve below, or if it, too, cracks apart and disintegrates against the mountainside. The last of the evening light merges the high peaks around me with the off-white cloud and the snow, the distant blue of the sky and the ocean. The view softens and hazes, fading slowly toward the night until everything feels as one thing. I want—I need—our summits to keep their glaciated flanks and their ice-cut ridges. Without their snowy surroundings, much of their mystery, their character, will fade away. We're only just becoming aware of what we're losing. The inevitability of transformation is disheartening. Yet I can't help hoping, rather naively, that what I'm looking at won't change. This On Belay first appeared in Alpinist 38—Spring 2012. Issue 38 is available direct through our online store.